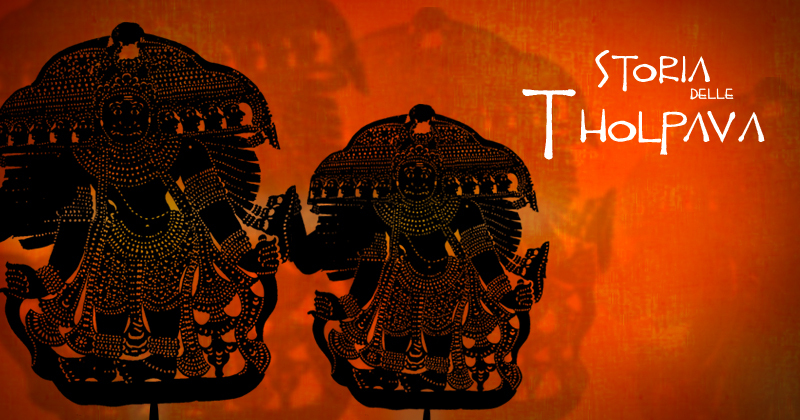 The puppet plays are based on selected verses from the famous Tamil Epic ‘Kamba Ramayana’. The language used is a dialect of Tamil with an admixture of Sanskrit and Malayalam words. While formerly the puppets were made out of deer skin, the use of buffalo and ox skin is now commonly used. The puppets are held by a thin stick in one hand while the limbs are manipulated by a thinner stick held in another hand of the puppeteer. About 160 puppets are used for the complete version of the “Kamba Ramayana”, representing 71 characters in four main categories (sitting, standing, walking, and fighting) besides puppets to depict nature, battle scenes and ceremonial parades. The screen is illuminated by 21 lighted lamps, made out of coconuts cut in half, filled with coconut oil, provided with cotton wicks and placed equidistant from each other on the Vilakku-madam (wooden beam) behind the curtain. The shadow puppetry of Kerala, Tholpavakkoothu, is experimenting with non-traditional themes in order to preserve and make the art form relevant.Although traditional artistes have been staging special programmes of Tholpavakkoothu outside the confines of temples and even abroad for the last few decades, the centuries-old ritual art has not swerved from its traditional theme of narrating stories from the Ramayana. Although the puppeteers of Kerala are patronised by the temples for nearly four months every year, it has not been easy for them to sustain their livelihood by performing shows in the traditional style. The Gandhi being unravelled in ‘Gandhikkoothu,’ which has been scripted by novelist Nandan, is some one who embodies a number of noble ideals. For Ramachandra Pulavar, it is a tribute to his father, Krishnankutty Pulavar, who had ardently desired a change in the traditional character of the folk art by adopting the life of Gandhi. Unfortunately Krishnankutty failed to secure a script for the purpose. “We would need about 42 puppets to represent Kasturba Gandhi, Manu, Jawaharlal Nehru, Mahadev Desai, Sarojini Naidu, Patel, Abul Kalam Azad, Pyarelal, Kelappaji, Nathuram et al. In the traditional format of Tholpavakkoothu, the story of Rama is being told through 182 puppets,” says Ramachandran Pulavar. The show will begin in the traditional style with Ganesavandanam and Kalarichint. Performed in a flash back mode, ‘Gandhikkoothu’ would feature the important episodes in Gandhiji’s life such as his brush with apartheid in South Africa, relations with his wife, Kasturba, the Dandi March and his death at the hands of Godse. Mahabali Koothu puppet play tell the story of the Kerala national festivals Onam.The history of Onam, Kerala and king Bali life are the main sequences of the puppet play. The story is being from the rule of king Bali and fight with Devas, and Devas are planned to kill Bali, they went to Lord Vishnu tell her sadness. Vishnu is ready to go fight with Mahabali, he take new avatar VAMANA and go to Mahabali place and asked three feet land to Mahabali, he is ready to give what vamana is wanted , vamana is measuring the feet the first two feet he measure the earth and the sky. Then there is no place to measure, Mahabali said please put your leg in my head there is no other place to give you. Mahabali go to under earth and he asked one blessing from Vamana, he wants to visit his people once in a year that ay is Onam all the people in the land are enjoying and celebrating with us. The play is consists of 45 minutes durations, keeping the traditional style of the narration, there is 65puppets is needed for this play. At the first-ever national-level competition of puppetry shows at Udaipur in 2000, which was organised by the Sangeet Natak Academy, Pulavar’s troupe staged a 60-minute play titled ‘Panchanana Punerjani’ (‘Resurrection of Lion’). Even though the theme was taken from the ‘Panchatantra,’ the message conveyed was of communal harmony. Shadow puppet theatre, one of the oldest forms of audio-visual media, which has the epics, folk tales and fables as staples, will now have Biblical stories as its theme. According to Ramachandra Pulavar, a leading exponent of shadow puppet theatre in the State, his team, Thavalappara Naadan Kala Sanghom, has given shape to characters from the Bible in leather to present the biblical stories through the medium of puppet theatre. 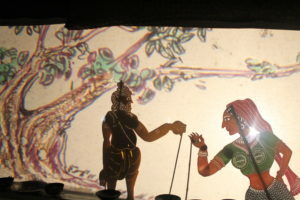 In the Contempory scenario , we get to see introduction of newthemes into the traditional forms,where issues like prservations of forests, family planning etc are the epic stories.also innovations in the form, where different styles are merged systematically to produce more cohesive meanings, reflect various experim3ents in the artistic and utilization aspects of puppetry. Puppetry is also used in popular media like television shows, in social instutions like schools as part of educational programmes and in hopitals as part of health care programmes. These kind of puppets show are created under the Krishnan kutty pulavar Tholpavakoothu and puppet centre. Shakespeare’s ‘Macbeth.’ “We want to take our art beyond the borders of Kerala and a universal play like ‘Macbeth’ will help us greatly in our aim,”. Celebration of Water – a story based on the misusage of water and its effects . Rajiv Pulavar premiered Chandalabhikshuki, their latest production in puppetry, inspired by the poem with the same title by the great Malayalam poet Kumaran Asan. The production used a modern approach to the traditional shadow puppetry, incorporating contemporary techniques and technology that included actors and other puppets. Rajiv Pulavar, who was recently honoured with Ustad Bismillah Khan Award for Young Talented Artist (2016) by Central Sangeet Natak Akademi, ..
Tolpava Koothu is the unique shadow puppet theatre form of Kerala. It is an ancient peculiar ritualistic art form dedicated to Bhagavati, worshiped by the people as the Mother Goddess. I t is chiefly to propitiate Bharakali (Mother Goddess) that Tholpavakoothu.Is performed in her temples and the devotees believes that the goddess watches the performance and would be pleased by it. This belief is based upon the following legend. In the battle between Devas and Asuras, the Asuras were bitterly defeated by the former. In the prolonged battle, only four women were left alive. And they were Dhanapathy, Dheenapathy, Vanika, Maneeshika. Among them, Dhanapathy who was blessed by the boon of the Brahma gave birth to a son. Long ago the creator, Brahma, blessed an asurastri (demoness) and as a result of his blessing she gave birth to a son named Darika. When this asuras (demons) boy grew up he became so strong that he turned out to be threat constant source of harassment to the gods and maharshis-sages and hermits, they approached lord Shiva for help. In order to Darika, shiva created the goddess Bhadarakali from the kalakoota poison lodged in his throat. A fierce fight ensured between Darika, and Bhadarakali, lasting serval days. Finally Bhadarakali killed Darika, while Bhadarakali was engaged in fighting Darika; Rama was fighting Ravana, so Bhadarakali was not able to see Rama and Ravan fight. That is why the Ramayana story is enacted in her presence through Tholpavakoothu. Our ancestors are written documents in the palm leaf text. Source of palm leaf text and the preservation of the palm leaf text.